We recently wrote about stealth startup Project Fair Bid, which aimed to reinvent and legitimize a controversial bidding model pioneered by Swoopo. Today, Project Fair Bid is emerging from its cocoon as BigDeal.com, an auction-based e-commerce site which takes a different twist on the questionable paid bidding model. 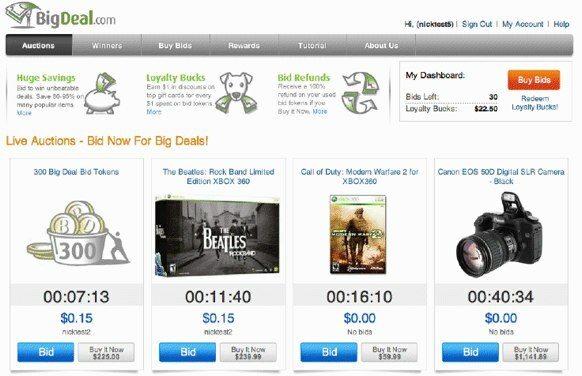 Similar to Swoopo, BigDeal lets users purchase virtual bids $0.75 each which can then be used to bid on goods ranging from video games to high-end televisions. Whenever you bid on an item, its price increases by $0.15 and an extra 30 seconds are tacked on to the duration of the auction. With this model, items end up selling substantially below their market value. But one of the main criticisms of Swoopo was the risk of losing your money spent on bids (regardless of whether you win or not) when the auction concludes. BigDeal takes a couple of steps to mitigate this risk. That’s not all. 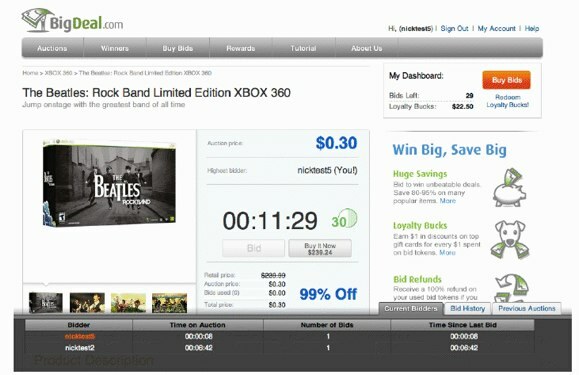 BigDeal provides an added incentive for bids by letting all users trade in the money they spent on bids for gift cards. All users get $1 gift card discount for every $1 spent on bids. So if you buy $25 in bids, BigDeal will give you a $100 gift card for $75. Gift cards that can be bought are from prominent retailers such as Amazon, Gap, Walmart, Foot Locker and more. It all sounds too good to be true, right? Well, Big Deal admits that they are taking a cut when it comes to the gift card bonus, but the incentive is designed to build loyalty around the site and draw a viral following. Big Deal monetizes by taking a percentage off of the sale price. For now Big Deal, which is open to the U.S. only, is concentrating on consumer electronics but hopes to expand to additional verticals in the near future. Big Deal’s founders all have significant experience in both the auction and e-commerce space, with alums from eBay, Yahoo Shopping, Walmart, and more. from The startup raised $4.5 million in funding from from the Mayfield Fund, First Round Capital, and Foundation Capital, with Raj Kapoor, Charles Moldow and Josh Kopelman on the the board of directors. There is evidence that Big Deal could takeoff. While Swoopo’s model was controversial, the startup was able gain a loyal following since launching in late 2008, with the site counting nearly 2 million members in Canada, Germany, the U.S., Austria, and Switzerland and recently raising a $10 million funding round led by August Capital. It seems that Big Deal has taken the best elements of Swoopo’s model and added several features which make it more of a win-win for consumers. Plus, it adds information, like bidding history, to the process to make the auction more fair. And the very least, you can leave the site with a gift card, so the money you spend on bids isn’t completely lost. While the site will face competition from Swoopo, and even eBay to a certain degree, it is compelling. After demoing the product, I’m actually a fan and am looking forward to trying it out to perhaps check some items off of my holiday shopping list. Like any auction model, Big Deal requires more of a time investment than a direct buy retail site but it’s actually fun to compete for a product. I’m just waiting for the site to start selling designer handbags.